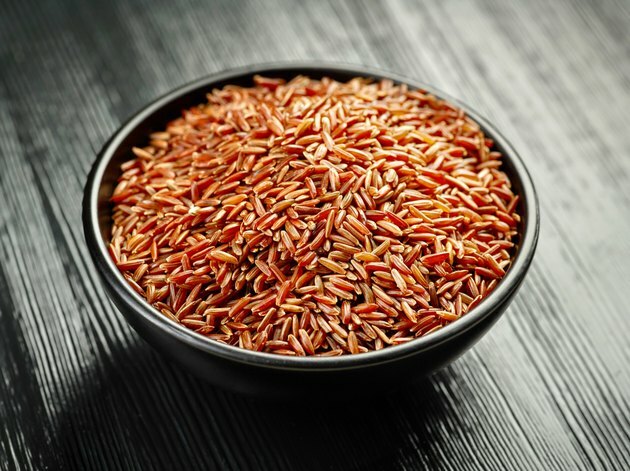 Red yeast rice, made by fermenting yeast called Monascus purpureus over red rice, has a long history of use as both a food and a medicine in China. Red yeast rice contains monacolin K, which has properties very similar to those of the lovastatin, part of the family of cholesterol-lowering prescription medications known as statins. Few clinical tests have looked at the benefits of red yeast rice to treat other cardiovascular disorders, including hypertension, or high blood pressure. Available studies have mixed results. Do not take this product to reduce hypertension without your doctor's approval. An animal study conducted by Chinese researchers and published in the 2003 "Journal of Agricultural and Food Chemistry" tested an aqueous extract of Monascus purpureus M9011 on rats with induced hypertension. Intragastric administration of Monascus purpureus M9011 reduced blood pressure to normal levels. The same amount of Monascus purpureus M9011 did not reduce blood pressure in rats with normal levels. A human Chinese study conducted by researchers from the Fu Wai Hospital and reported in the 2010 "Clinical and Experimental Hypertension" studied the effects of Xuezhikang, a partial extract of red yeast rice, or placebo on 2,704 patients with hypertension. The long-term study, which lasted 54 months on average and which lost around 25 percent of subjects to follow up, showed no difference in blood pressure between those taking the extract and those taking placebo at any point in the study. Because red yeast rice contains lovastatin, it has the same potential side effects, including headache, dizziness, diarrhea, stomach ache and muscle and joint pains. Changes in liver enzymes can indicate possible liver damage. A serious condition called rhabdomyolysis, caused by the breakdown of muscle, can lead to permanent kidney damage. Red yeast rice sold in the United States must have lovastatin removed from the product. It's not known whether these altered products would have the same effect as red yeast rice with lovastatin. The normal dose of red yeast rice to lower cholesterol is 600 mg two to four times a day, according to the University of Maryland Medical Center, but there is no clinical proof that this dose would treat hypertension.